Born in Slovenia, Ištvan Išt Huzjan has made Brussels his permanent home. 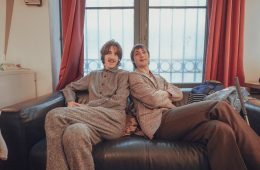 Not only the artist’s studio is located in the Belgian capital, but for the last five year’s he has also been co-running Artists Club Coffre Fort, an unconventional exhibition project showing art in a former vault. Earlier this year, Ištvan participated in the very first edition of “A Performance Affair”, a newly founded performance festival putting the spotlight on a genre that doesn’t always get the attention it deserves. 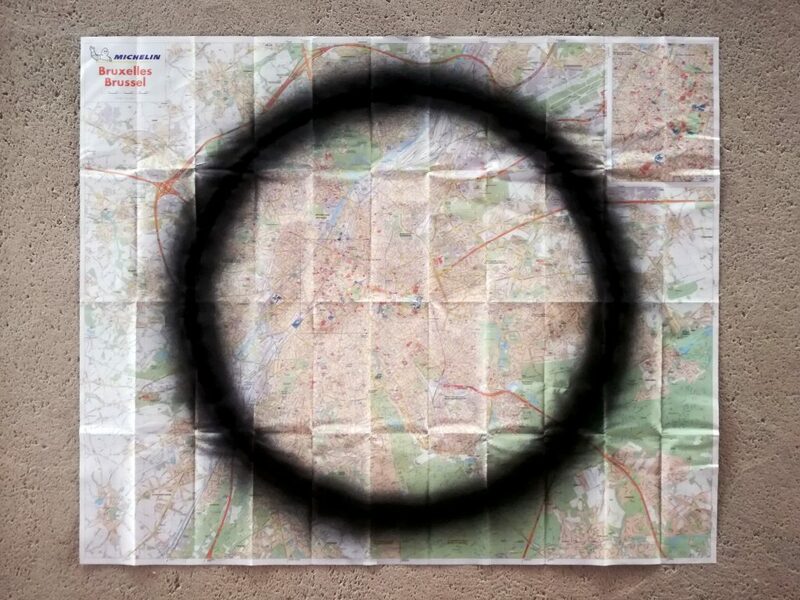 His performance “Line Umpire”, which consisted of the artist walking the entirety of the Brussels regional border, instantly caught our attention, and we had a chat with Ištvan about the intriguing idea, Belgium’s regional divide, and so much more. How would you describe your artistic universe? How do you usually introduce yourself – as a conceptual artist? Since most of my practice focuses on deconstructing images and their formulations, uses language and can not really anchor itself in any particular medium I guess I belong to a tradition of conceptualism… but if I am honest this kind of conversation rarely comes up. Most often within the art crowd I just say I do performance, make books and sculptures and to a wider audience I claim I am a painter. What role does performance play in your overall practice? Besides my studio work, I sometimes have ideas for images that demand my physical presence. All my performative acts are, in one way or another, a measurement. And the measuring tool is my body. It’s rare that an audience is present at my performances, which is why I document these measurements or movements with the help of photographs and objects. This is where my publishing practice comes in: my artist books are travelogues, sort of. How did the idea for the walk come about? What’s the message and the goal behind it? What’s your relationship to Belgium? I’ve been working and living in Brussels since 2011 and after almost a decade I consider it my second home. My hometown is Ljubljana. Between 1942 and 1945 it was occupied by the army of the Italian Kingdom, and after its capitulation in 1943 by the army of the Third Reich. Ljubljana was completely encircled by light fortification (wire, bunkers, reinforced entrances to the city…) and closed off from the outside. For three years, it was impossible to leave the city. After its liberation, people removed the wire and started the ritual of walking along the line where the wire used to stand – every 9th May, the anniversary of the liberation. It became so popular, that in the 60s a proposal was put forth to build a walking path commemorating the siege. A 4-meter-wide and 34-km-long tree-lined path of white pebbles was built in the 70s featuring monuments and commemorative signs along the way, and the walk still happens today. As I grew up right next to it, this path has a special meaning for me. The locals have integrated it into their daily life by taking walks with their dogs there, meet neighbours, or exercising, and teenagers hang out on the benches. But during World War II, this same space was used to control the city’s inhabitants. Ljubljana was a sort of an enclave, a panopticon. It made it even easier to control the wider region. As the first edition of Brussels festival “A Performance Affair” was titled “Panopticon”, it made me think of Ljubljana’s past. Today’s Brussels is also an enclave. A bilingual enclave, and of course very different from Ljubljana in the 40s, but also serving the purpose of keeping control, or balance. 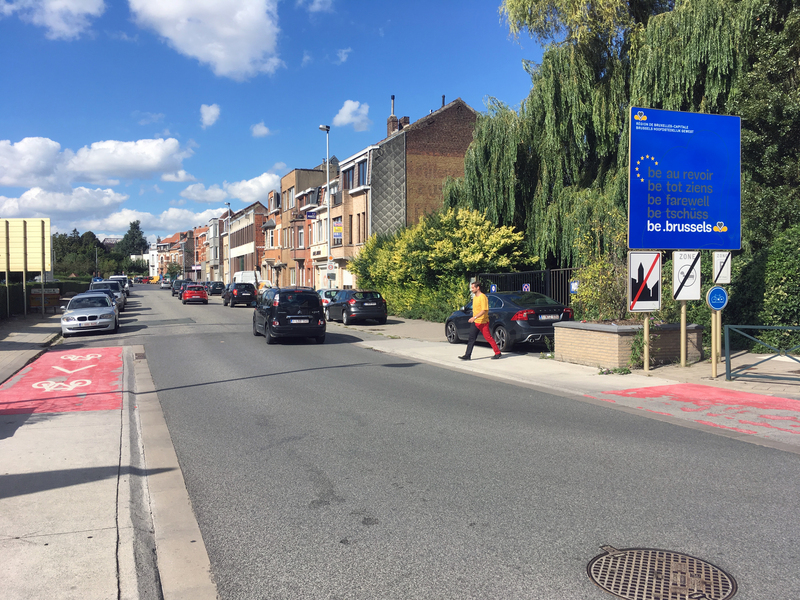 My idea behind my performance “Line Umpire” was to walk the Brussels regional border in order to see it and examine it las a non-partisan observer. Someone who does neither speak French nor Dutch. Looking at your practice and past exhibitions, walking as a theme seems to be a returning motif in your work. Why? As I mentioned before my body is a tool to measure with. Walking is one of the basic ways to do so, moving in an erect position and perpendicular to the centre of the earth. Stepping horizontally on its surface while meeting others seems to me a very human way to measure time. The regional divide you mention – how have you, as a Slovenian, experienced it yourself? Yes, I have. Generally, Belgians, both Dutch- and French-speaking, in particular Belgian artists, are nice, humble and humorous people. The only negative experiences I had in this context were with French expats. They always think I speak the wrong language and ask me why I don’t speak French and when I will learn it. My take on Brussels’ linguistic and political issues: the more languages, the merrier. I am against one-language-solutions; or one race, one flag, one nation… one is a terrible number. How did the performance work practically? I tried to do it in one day but it wasn’t possible. The Brussels border is 76 km long. That’s why it took me three days. My partner Tine accompanied me, and she also took care of the social media coverage. We had Instagram stories under the hashtag #istvanisthuzjan, and sent photographs and the coordinates of our position to the headquarters of the performance festival. We walked about 8 to 10 hours a day and then took the metro or bus to our flat in the city centre. In the morning we would take the same transport back and start from the same spot where we had stopped the day before. My costume was kind of funny. 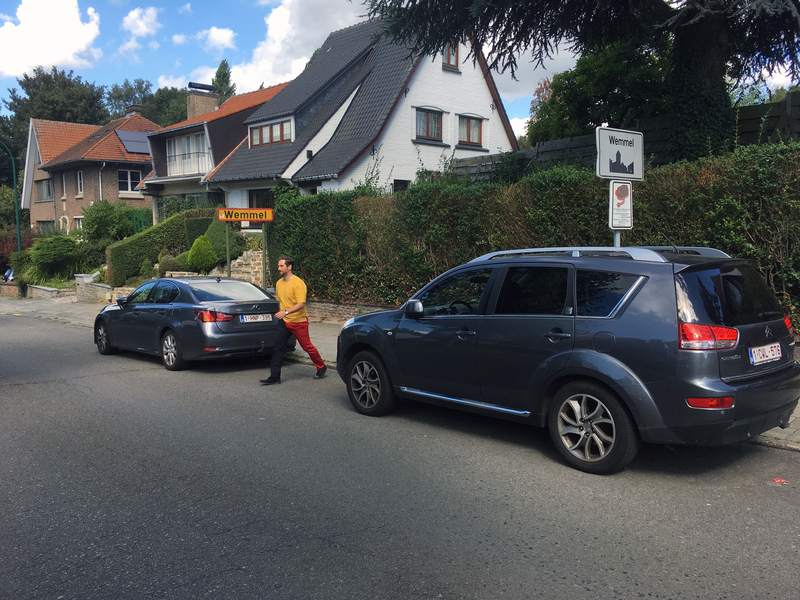 I wore black-red pants and a yellow t-shirt. 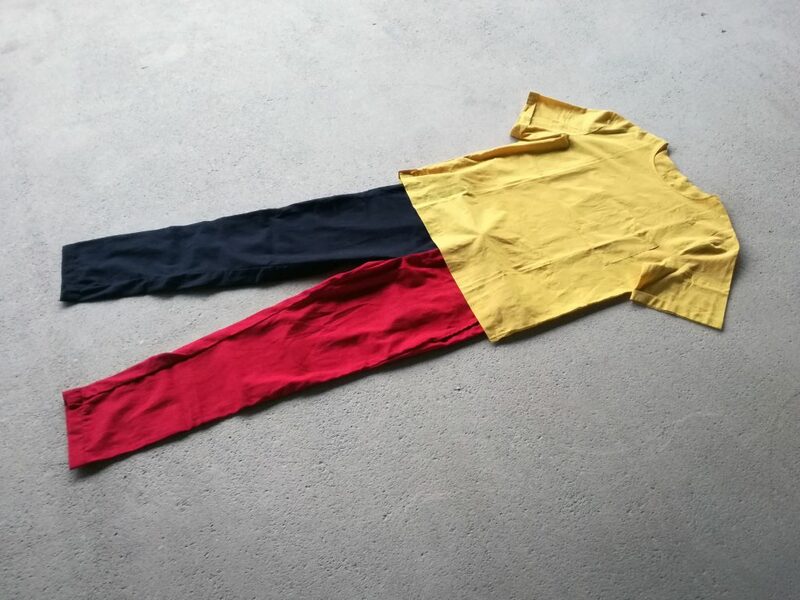 Just like a Belgian flag, I was walking with the black leg in Flanders and with the red one in Brussels. I looked like a jester. This was my way of making the line visible. My prediction was it would make people curious but in fact no-one really responded so I had no conversation or contact with people on the road. I think it’s a bit of a shame. What fascinated you about doing a performance in public, not in an art venue, with possibly no direct “audience”? The performances I do are usually situated in the public sphere. I am more interested in connecting everyday life with art, as opposed to using a stage where everyone expects an illusion. My performances are constructed like our daily chores: I do a certain activity in a certain timeframe. For example, I will put aside an hour to vacuum my apartment. I will not get paid to do so, but in today’s society, maintaining a certain level of hygiene defines what kind of person I am. The same principle is applied when I walk a certain distance, hide in a bus luggage compartment, ask a curator to walk around with me in a suitcase, or clean the streets of New York. Regarding walking in connection to art: do you feel close to artists such as Hamish Fulton and Richard Long? Yes. But even more so to the artists of OHO and Gutai. Do you find it difficult to reconcile performance with the necessity of exhibitions and “monetizing” your art? No. I developed a system making sure that there are aspects of my practice which are equally interesting and challenging as performing. When I make a book after a performance, I consider it a separate work. The same is true in regards to the market. Every single performance exists in the form of one chosen photograph representing the action, each time in a specific size, specifically printed and framed, and accompanied by text. They are all editions of five. This way, they are quickly recognisable and easy to exhibit. I run it together with Thibaut Espiau and Gregoire Mott, and it’s still a complete joy. 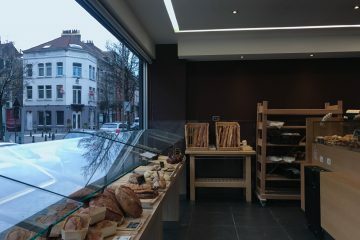 We have been doing exhibitions for five years now at Hopstraat 63, and next year we are even expanding. It’s very exciting. Our motivation has always been meeting people. 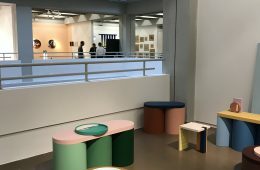 We are more of club than an exhibition space… It is pure fun for me but I believe that our different format and particularity of the space contribute to the diversity of what Brussels can offer. Do you think it’s a good place for an artist? Since the beginning I am divided between Ljubljana and Brussels, but I do spend most of my time here, where my studio is. I enjoy working here but at the same time it is easy to detach myself from Brussels and maybe that is what allows me to stay longer. Brussels doesn’t weigh on a person and it constantly offers new possibilities, just like it is constantly searching for its own character, but in reality this is exactly what defines it best.